Nightcrawler, an X-Men mainstay and one of Logan's few close friends, is dead. A fatality of the team's desperate battle with Bastion in Second Coming, Kurt Wagner left his comrades with little more than hope, a fistful of memories and one final wish: that Logan deliver a twenty thousand dollar piano to a remote Venezuelan church. The catch? That congregation is located at the top of a towering mountain, inaccessible via modern means of transportation. Wolverine's going to have to haul the thing up a long slab of rock to fulfill his friend's last request. In Weapon X #16, the limited series' final issue, author Jason Aaron doesn't celebrate with a traditional hokey epilogue. Instead, he cuts the central character to his core, investigating an under-explored human side to Wolverine that's often lost in the red mist of another violent black ops mission. Splitting time between a piano-laden present and a confrontational series of flashbacks, the issue dissects Logan and Kurt's long friendship over the years and slowly reveals how it changed each of them. In their own way, these two were the mutant version of the odd couple: one a slim, agile man of faith and introspection, the other a thick, powerful brawler who'd rather rely on his beer-drenched senses than his mind. And while death may be every bit as fleeting as life is in the world of comic books, the realization that half of that duo is gone still tugs at the heart strings thanks to a simple, clever premise and some slick, emotion-soaked writing. A great deal of this issue is spent examining Logan and Kurt's arguments over faith, religion and the afterlife, with one playing the dedicated man of devotion and the other the incendiary skeptic, neither able to budge the other's position, both leaving the discussion frustrated. Logan may have the final word on that matter in terms of physical presence, but in reality Kurt's taken the right for himself, giving his friend a mission of solitude, a chance to dwell on the heart of their lifelong argument for lack of any other stimulation. Aaron doesn't pass on the opportunity to elaborate, and while the line he draws at the end of the issue may not be entirely true to the character, it does make for a stunning final page and an appropriate conclusion to the relationship. Alongside such deep, existential commentary, artist Davide Gianfelice's loose, curvy, energetic style doesn't always feel appropriate. 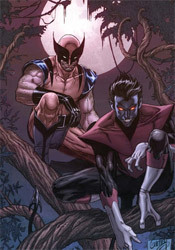 Particularly during the flashbacks, when Wolverine and Nightcrawler appear in full costume, Gianfelice's artwork is completely out of place – exaggerated to the point of distraction, regularly bright and cheery when the subject is about as dark as it gets. While his take on Kurt feels just about right, Davide's renditions of Logan are inconsistent and unfamiliar. Both characters appear thin, lanky and European, as if he's only comfortable with one body type, and the only differences between the two come by way of skin color, hair and wardrobe. Gianfelice has his merits, particularly in his compositions and backgrounds, but his rambunctious technique was a poor match for this kind of story. There's no question that too many Wolverine books are still flooding the market, so I can't mourn the loss of this title (especially considering it's being immediately replaced with another) but it is a bit disappointing that we're losing this series just as it's beginning to reveal new facets of the character's personality. This self-contained story is well written and easy to appreciate, and while the artwork is mismatched, it's also not bad. Borrow it.